I almost thought I wasn't going to get a chance to post this today. I've been a little absent the last couple of weeks. Work has been very busy and I have been grading every spare moment. That has severely cut into my personal time. I haven't picked up a book in awhile! But! Spring Break is coming up (first week of April), and I am excited to dive into the pile of books on my nightstand. I'm devoting a lot of time to reading and of course, organizing the boxes we still haven't unpacked that have been sitting ignored in the basement, but what better time to create a big old book list? hooray! 1. 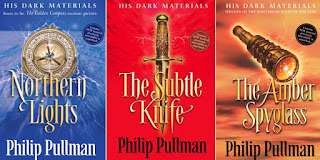 The Subtle Knife, The Amber Spyglass, and The Book of Dust by Phillip Pullman: I read The Golden Compass a few weeks ago in hopes of rereading the trilogy before getting to the new release. 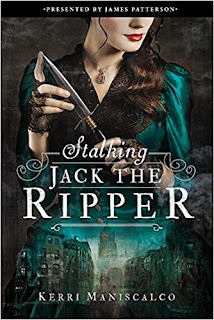 And while I am a couple chapters into The Subtle Knife, I just haven't had time to finish it. If I don't get a chance to read before break next week, this will probably be the focus of my Spring break. 2. 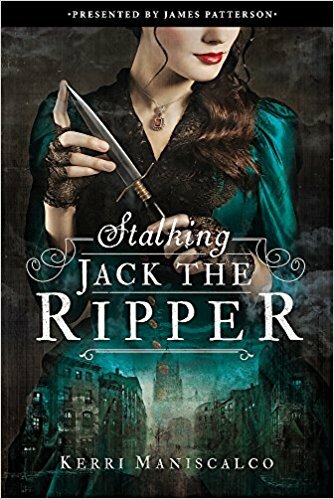 Stalking Jack the Ripper by Kerri Maniscalco: This is one of two books left in my pile of books for our "Battle of the Books" competition we're running this year at the high schools. It's truthfully not a book I would pick up normally, but I figured I should read it for the event (I am definitely going because Andrew Smith (Winger, etc) is going to be skyping in to talk to the kids. I'm all about that). 3. 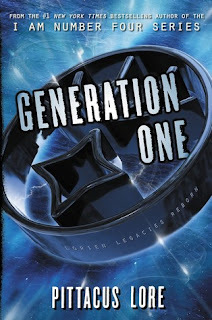 Generation One by Pittacus Lore: This would be the other battle book. And again, not excited about it. 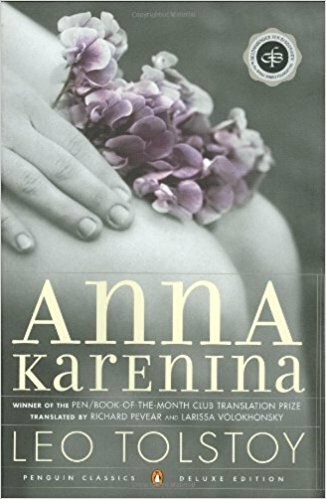 I did read the first chapter a week or so ago during my juniors' silent reading time (when I read with them, they are more focused). I wasn't hooked, but I definitely want to give it another shot. 4. 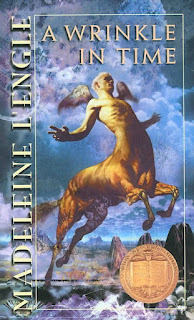 A Wrinkle in Time by Madeleine L'Engle: Truth: L'Engle was one of my favorite writers as a teen. I own SO MANY of her books and most are well-loved, but I haven't read Wrinkle in a very long time. I had originally planned on rereading before the movie came out, but here we are. I'd like to read the whole series, but it might get pushed back. 7. 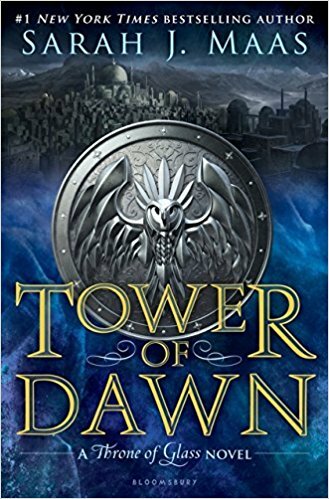 Tower of Dawn by Sarah J. Maas: I BINGED on Maas' work a couple years ago and have been trying to savor what's been published. This was published back in the fall and it has been taunting me on my bookshelf ever since. I love her worlds, so I'm excited to get to it! 8. 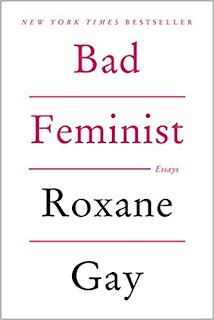 Bad Feminist by Roxane Gay: I loved Gay's Hunger, which I read last summer. This has been eyeing me for a few weeks and I'd love to settle in to read it. I actually might move it to my nightstand tonight! 9. 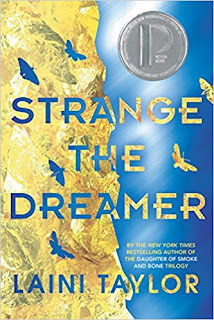 Strange the Dreamer by Laini Taylor: While I kind of enjoyed Taylor's trilogy (Daughter of Smoke and Bone), I've heard really good things about this title. And like many other books, it's been sitting on my TBR for a few months. 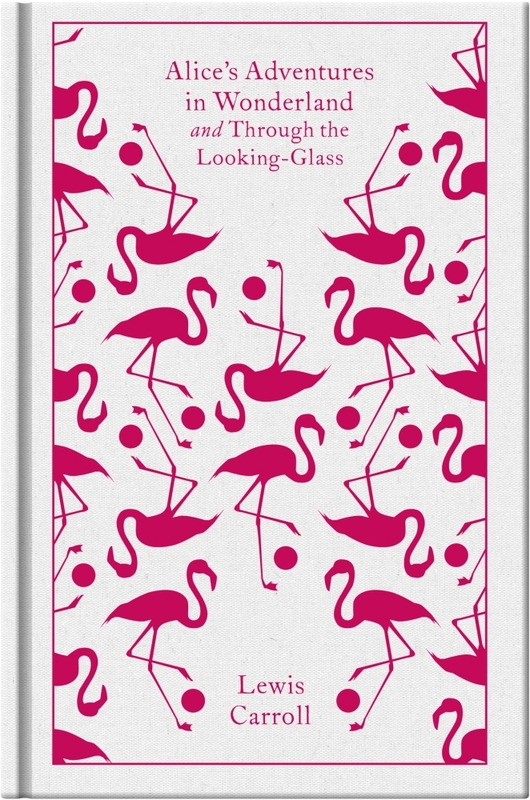 This needs a good long weekend to read, so maybe an April readathon book? 10. 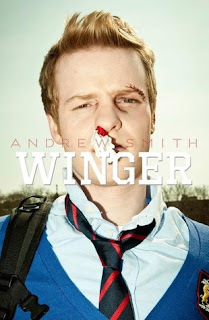 Winger by Andrew Smith (and the sequel, Stand Off): My recommendation for the Battle of the Books was this title, and I was super excited when it was picked. I loved the book (read it in one long night), and the kids I've recommended it to have loved it as well. It's been a couple years and while I own the sequel, I haven't had a chance to read it. Now I feel like I need a reread before moving on. :) And it's Smith, so I know I'm going to be obsessed. 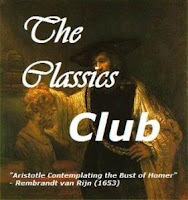 Top Ten Tuesday: Favorite Book Quotes. I wasn't originally sure if I was going to participate this week or not, but well, I couldn't help it. I love a good quote from a book, so this week's list was right up my alley (and it's been a couple weeks since I last participated). 3. “In my younger and more vulnerable years my father gave me some advice that I've been turning over in my mind ever since. 7. “I always want to know the things one shouldn't do." 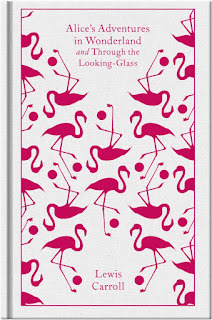 Weekly Wrap-up: Illness, TV, Professional Reading, and Books. It's been 2 weeks since I last sat down to write some posts-whoops! Last weekend got away from me and I didn't manage to sit down to write a weekly post or any bookish posts. egads. I was actually sick...still? Again? The flu that I had turned into walking pneumonia and I was down for the count again last weekend, even resulting in taking another day off work. I finally got some new meds and I feel like a whole new person, so I'm hoping I finally kicked it this time. My horrible cough is gone, as well as the fever and chills, so yep. Definitely feeling better. I'm hoping that the 3 weeks I spent sick was it for the year, but I know that's wishful thinking. I inevitable get a cold before the school year is out, and get sick once I'm on summer break. So yep. I'm good now and I guess that's all that matters for the moment. Speaking of break, we only have 4 weeks of school until Spring Break. Say what??!! This school year is flying by and I've been crazy busy between teaching, grading, committees, clubs, etc. Where has this year gone? I definitely feel more comfortable and confident in my teaching this year. I'm trying new things (as always) and reevaluating some old processes to make way for new. I definitely feel...accomplished as a teacher-more like I know what I'm doing instead of flying by the seat of my pants. I'm managing my grading and prepping workloads much better than I have in the past, and I'm maintaining a better work/home balance-more so than ever before even though I'm busier this year. It's really nice to be able to leave work at work (sometimes) and relax as I need it. That being said, I did grade for a solid 6 hours yesterday and have a little I need to do today to feel better about going into a busy week. I'm finishing up World War II with my APUSH students and it's at this point in the year that I wish I had more time. Unfortunately we have to keep moving because of their AP test on May 11th (getting close). That class is a constant stream of assignments to grade and assess, so I can never relax for more than a day or two. My Shakespeare class this semester (the only semester class I have this year) just finished our intro unit and sonnets, so we're diving into The Taming of the Shrew this week. This is now the...7th time I'm teaching the play and I still love it. My juniors (low-level) are in the middle of Night and just finished an Identity presentation (they were fabulous and the kids shared so many personal stories). We'll be wrapping that up in the next two weeks before a short, 2-week unit on SAT writing before break-they take the SAT the week we return. This weekend I'm headed down to Detroit for year #3 of chaperoning my school's DECA chapter at the State conference. I love this trip. Even though the business/marketing world is pretty foreign to me, I love the experience of working with the kids in a different element, and judging is always fun. Last year I got to pretend to be a resort owner for a luxury spa. The year before I was the owner of a razor company that was trying to market to women. It's a fabulous weekend filled with great food (Detroit has amazing restaurants) and good company. I told the DECA coach that as long as he'll have me, I'll go. We're going down a night earlier than normal, so we're leaving directly from school on Thursday. This means I have to bring my suitcase with me to school and get all my stuff packed early. We come back Sunday afternoon, so it's a longer trip. But I'm looking forward to the time I get to spend vegging and exploring on my own. I'm going to bring our Firestick so I can keep watching some of the shows I've started. I used to be a huge TV watcher, but over the last few years, I've cut back pretty dramatically. I have shows I put on for background noise while I grade, but I am very out of touch with new stuff (and things everyone has seen but me). I would just truthfully rather read. But since getting sick, I've spent a lot of time bingeing on TV. I watched both seasons of Disjointed on Netflix (pretty funny), as well as all of Archer, The Unbreakable Kimmy Schmidt, and Atypical. I'm currently plowing through Parks and Recreation (I watched the first two seasons a couple years ago with Matt and never finished). I also started Downton Abbey (I own the series on DVD) on my own and The Mick with Matt. What other shows should I watch? I'm saving Stranger Things for Spring Break! In terms of reading, I've slowed down a little. 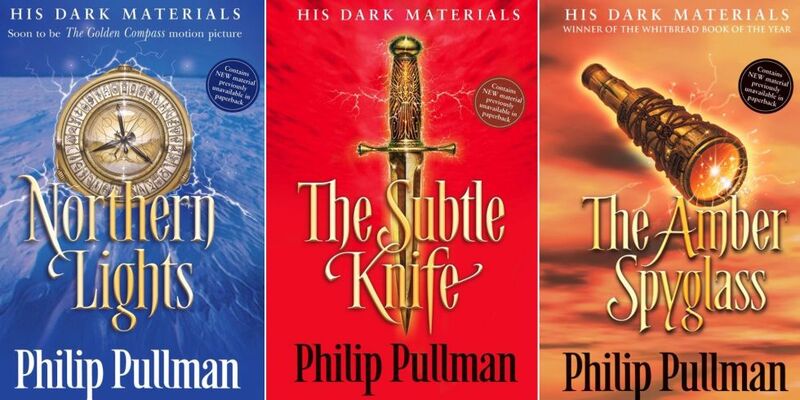 I flew through The Golden Compass last weekend and while I have The Subtle Knife on my nightstand, I haven't started it yet. 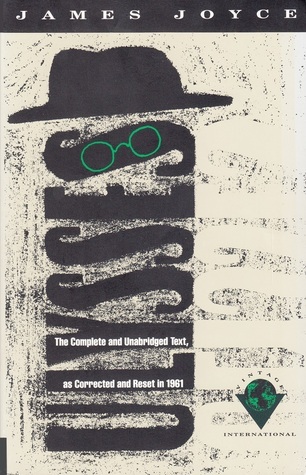 I did read about 40 pages of Ulysses this week, but honestly, I think I need to wait until summer for something so thinking heavy. I did finish a bit of professional reading this week. Our district had some grant money that needed to be spent, so our English curriculum director purchased all the high school ELA teachers a copy of Penny Kittle's Book Love: Developing Depth, Stamina, and Passion in Adolescent Readers. For someone who reads as much as I do, I am terrible about encouraging my high schools to read independently. This book was fabulous (review forthcoming) and I can't wait to implement some of her strategies into my own classroom. I already started a new SSR initiative with my juniors this semester and I'm already seeing results. She also talks about a bunch of books throughout each chapter, so I added a ton to my reading list. This week I'm planning on reading The Subtle Knife. Depending on how it goes, I'm going to be bringing a few books with me this weekend. I usually have a few hours of downtime on Friday and Saturday, so I'm planning on spending it curled up in my hotel bed with some good books. I'll definitely bring The Amber Spyglass and The Book of Dust. 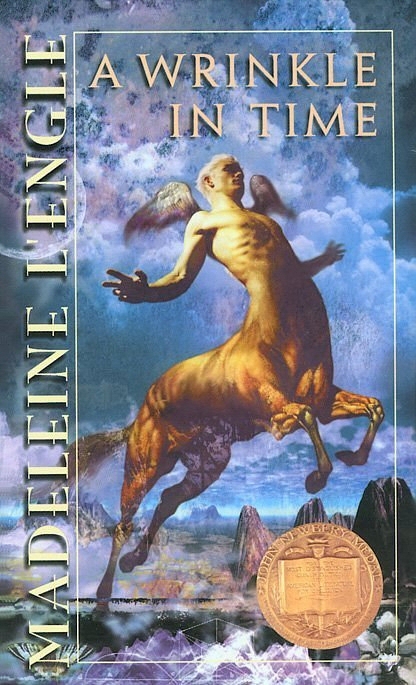 I'm also thinking A Wrinkle in Time since I wanted to get to it before the movie came out. I'm also feeling like I need to grab another TBR Challenge book, so we'll see what strikes me! Let me know what you're reading below! See you next week!